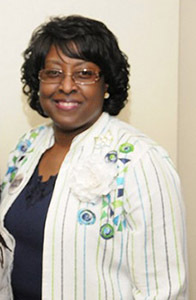 Dr. LaVerne McLaughlin is the Director of the Library and Archives at Albany State University, and she serves as the ALG Campus Champion and ALG Library Coordinator for her institution. ASU has a prolific record of successful Textbook Transformation Grants proposals, with seven teams funded in five rounds of grants. Behind all of these successful proposals and student textbook cost savings is the advocacy work of Dr. McLaughlin, raising awareness of both open educational resources and Affordable Learning Georgia. At a personal level, Dr. McLaughlin reaches out to individual faculty to consult with them on replacing textbooks with OER, often selecting particular textbooks for faculty to review for a potential implementation. At an institution-wide level. she has created both instructional and marketing materials to raise awareness of ALG, including a video for the 2015 ASU Annual Faculty Conference to both instruct faculty on the basics of OER and raise awareness of Textbook Transformation Grants opportunities. Dr. McLaughlin has also created instructional bookmarks and flyers for distribution at faculty events and within the library.